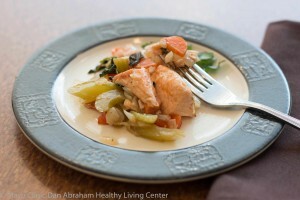 Did you know that major health organizations recommend eating fish at least twice a week? There are lean fish (pollock, haddock, cod, tilapia) and fatty fish (salmon, tuna, mackerel, lake trout, and sardines). Both are good for you. Generally, fattier fish are the best sources of omega-3 fatty acids. Omega- 3 fats are being investigated in their role in brain, heart, and joint health. Larger fish such as swordfish, king mackerel, Ahi tuna, and orange roughy among others have have high mercury levels. Limit your portion and frequency of eating big fish. Smaller fish are a more sustainable way of eating. Have questions about fish? Catch your DAHLC dietitians and chefs in our cooking demos.